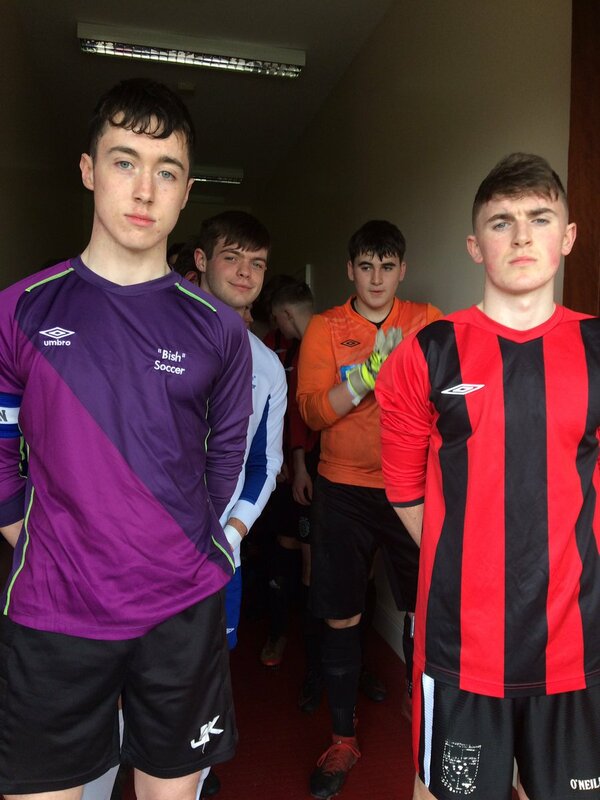 ST. EUNAN’S COLLEGE battle through to the Bank of Ireland FAI Schools Tom Ticher Junior Cup Final following a hearty performance against a much fancied St. Joseph’s College in Ray MacSharry Park this afternoon. The Ulster outfit had the perfect start to proceedings as Paul Bradley turned supplier for Ryan O’Donnell to grab St. Eunan’s College the opener on nine minutes. Their advantage in this tie was doubled 18 minutes in as an initial rocket from James Carolan was brilliantly saved by the bish Captain Cian Mulryan. The resulting corner delivered by the industrious Conor O’Donnell was patched beautifully to Daragh Ellison to see his header glance in at the far post. It was end to end action as five minutes later Galway lad Colin Kelly gave his side a lifeline when he netted to make it 2-1. St. Joseph’s dreams of a comeback were short lived as Conor O’Donnell got on the score sheet himself with 27 minutes of action played aided by the lively James Carolan. It ended 3-1 at the interval but the game could have swung either way in an open contest. Carolan was again showing a masterclass in fancy footwork as he evaded the Galway defence, however this efforts were damped as his shot hit the side netting ten minutes into the restart. As Galway were under the cosh for the opening exchanges, they managed to counter and their tireless work rate saw Wilson Waweru grab a second goal for Coley Kelly’s crew to bring the game to 3-2 with 56 on the clock. The hero, Waweru turned villain in a matter of 60 seconds as the goal-scorer was shown red following an altercation with Brendan Barr with the subsequent restart of the game. The youngster had kicked out at Barr after conceding a free kick to the winger, a dramatic finish would ensue with Kelly down to 10 men with over twenty minutes still to play! Eunan’s were enjoying a fine spell of possession which should have seen them increase their goal tally as Ryan O’Donnell and James Carolan both missed clear opportunities to convert. O’Donnell also hit the woodwork inside the hour mark for the Donegal School. The bish could have netted an equaliser only for the heroics of Eoghan O’Boyle as his incredible antics stopped a blazer from Colin Kelly right at the full time mark. 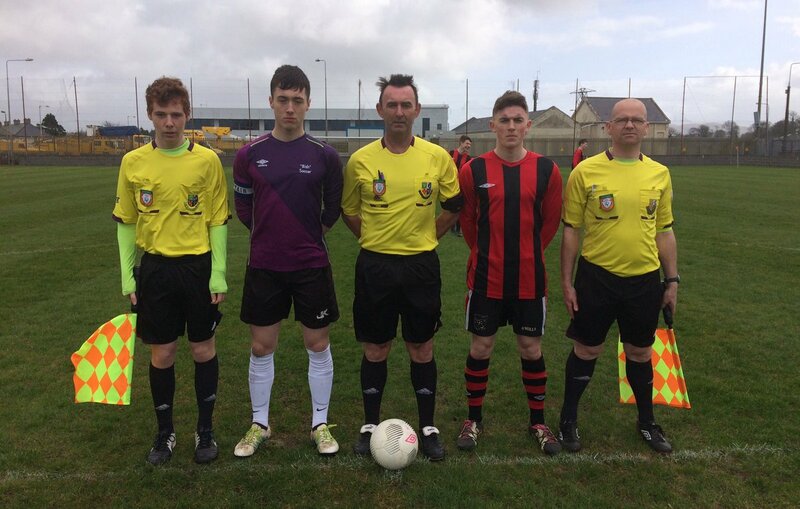 With over four minutes of injury time, the St. Eunan’s defence stood firm and deservedly march on to the Tom Ticher Junior National Cup Final on March 29. They await the winners of the other semi-final as Marist College, Athlone face St. Francis College, Rochestown in Pike Rovers, Limerick tomorrow afternoon, with a 1pm kick off scheduled.